In this 60 Parsecs! guide you will learn everything you need for a good start! 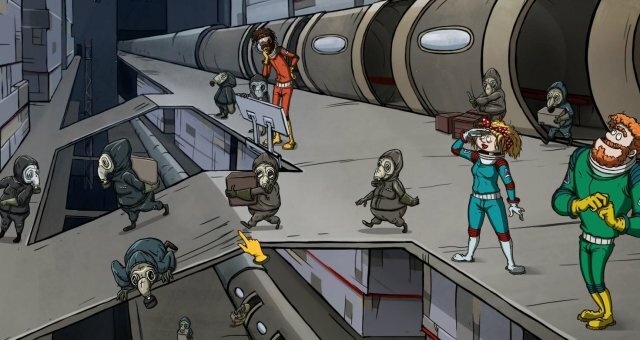 In 60 Parsecs we have 5 characters, each with unique abilities. Emmet, in my opinion, is the best character in the game. He's smart, runs fast, not so clumsy, and makes 2 resources of each kild EVERYDAY. You can win the game by taking him only, if you want so. Perfect for new players. Nice character, not as easy to play as Emmet, but not so hard as Tom. Perfect for whose, who want to play a nice, not-so-hard-not-so-easy game. Pretty good character, totally not the easiest, but still not the hardest. And his perk is great too. Keep a full crew alive for 30 days. (Full crew is the only ones, you taken from the station, not the 4 astrocitizens in the ship). Pretty hard character, pre-hardest one, because of no perfect or 3 pointed abilities. Runs slower than others (Just like Bronco). Has no 3 pointed or perfect abilities. His perk is a junk (Seriously, if you play well, you won't go insane at all). Thats all the characters we have. Moving on to the new page. Here's the list of all items in the game and what do they do. A telephone, but for space. You will neen this, then you land on the planet. For the fights, of course! Very useful in the late game. Need to fix the ship. Also, you will need this in most of events. To filter the air. You will need this in the early game. Protects your body. Useful in the middle and late game. Space expeditions are walk in the park with it. A handbook for all your needs. Very useful at the any stage of the game. Cant be crafted. The golden statue of the cow. Very useful in some of the events. Useful in some of the events. Helps in the dark places. The best weapon for every survivalist. Not really useful. Super-duper Duracell battery. Very useful in some of the events. Large box with some resources in it. (Chemicals, Minerals, Energy or Random). Can be found only on the start. So, you made it! You are in the space! But what to do next? This page of our guide will help you! Your crew needs food. Feed them once in 5 days, that should be enough. Try to land on the planet as soon as possible. There's a crafting device on the ship. Use it as much as you can. Think before you choose, what to do next. Craft medkit as fast as you can. It needs very much time to craft, so if you catched a desease, and there is no medkit, you very likely will be dead. Send expeditions on the planets. List of all the devices, what currently available in your ship. You can craft and recycle things and upgrade your spaceship here. Crafting machine needs resources, so you need to find them somewhere. Can be upgraded to make more items. You can see, what troubles meet your crew this day, and solve them here. Think before you make a choice! You can see results of the past day choices here. Send people on to scavenge in it. Can carry 2 things. Can be upgraded to carry more (up to 4 things). Pull it, and you will finish the day. Helps navigate your scavenges on the planet. Can be upgraded to go further on the scavenge.